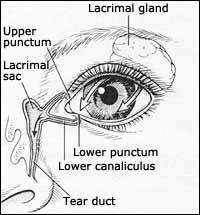 The lacrimal gland produces tears that flow over the cornea as shown by the arrows. The tears drain into two small openings at the inside corner of the upper and lower eyelids called the puncta. The tears drain into the tear duct and then into the back of your nose and throat. If an obstruction is present, it is usually at the tear duct as shown in the drawing. Tearing and chronic eye infections in infants are due to a blockage of the natural tear drainage canal. The tears in your eyes drain into a small opening located on the inside corner of your upper and lower eyelids. From there, they drain into the nasolacrimal duct (tear duct) which drains into the back of your nose and throat. That’s why your nose runs when you cry! In these babies, there is a persistent membrane in the tear duct which did not open at birth like it is supposed to. This is a common problem in infants and babies. In fact, one-third of all infants are born with an overabundance of tears and mucus. If the tear duct is going to open on it’s own, the obstruction usually clears within the first 6 to 12 months of life. As a result, if the tear duct does not become chronically infected, usually observation is indicated. After this time period, if the tear duct is still blocked, minor surgery is required. Surgery should be considered earlier if chronic infections become a problem. Rarely, overflow tearing can be caused by congenital glaucoma. There are other signs and symptoms associated with this serious condition such as enlargement of the eye, a cloudy cornea, high pressure in the eye, light sensitivity, and infant irritability. Overflow tearing can also be caused by wind, pollen, smoke, or chemical eye irritation. Initially, antibiotic and/or cortisone eye drops or ointment may be used together with pressure (or massage) over the tear sac. To apply pressure, place a finger under the inner corner of the infant’s eye next to the nose, and roll the finger over the bony ridge while pressing down and in against the bony side of the nose. This expresses mucus and tears from the sac. following pressure on the sac, place an antibiotic in the eye. Most tear blockage in infants disappears by 6 months of age. Tear duct probing is done when the tear duct closure remains persistent. A thin, blunt metal wire is gently passed through the tear drainage system to open any obstruction. Fluid is then irrigated through the system into the nose to ensure that the pathway is open. Infants experience no pain after the probing. Antibiotic/steriod eye drops are prescribed for one week after surgery. Surgery is done under general anesthesia for the protection of the infant. The procedure takes about 5 minutes. Obstruction can recur. If so, a repeat probing is done. In my experience, this is not a common necessity. If probings are not successful, plastic tubes can be placed in the drainage canals. This is a longer procedure than probing. Rarely, further surgery is needed to bypass the blocked tear duct and create a new opening through the bone into the nose.